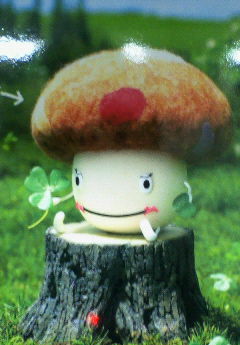 The Docomo mushroom family have become ubiquitous figures on the marketing infoscape of urban Tokyo. These mascots push DoCoMo's unique cheaper pricing plans. Their name comes from Jpanese wordplay where 'dake' means both 'only' and 'mushroom' - so DoCoMo -dake can be interpeted as meaning both "only from DoCoMo" and "DoCoMo mushroom".